If you’re in the need of a versatile and durable table saw then you have a few options from which to choose. One of these options is the Bosch GTS1031 table saw. A lot of handymen, both professional and otherwise, have chosen this model, but why? This article will provide you with a brief but thorough Bosch GTS1031 review. This model is extremely easy to learn how to use. This saw has advanced safety features. This table saw is very easy to store and take out. This model is compact when compared to many other similar table saws. The pricing of this saw makes it very affordable compared to a lot of similar table saws manufactured by other companies. This saw is versatile in that it can be used adequately for many different kinds of jobs. This model is relatively lightweight when compared to other table saws in the same category. Many users of this saw have reported that it is durable, long-lasting and does not easily wear out. The Bosch GTS1031 stand is included with this table saw. This model needs to be adjusted on a regular basis. This model is not Bosch’s “top” product in terms of table saws. 1. Does this saw come with an out feed support, and if not, is there an option to purchase one to fit on it? An out feed support is not included with this saw. One of the highlights of this model is how compact it is, and the fact is that an out feed support would detract from that feature. However, the fact that no out feed support comes with this saw should not be seen as a drawback because this particular model is designed to operate without a such support. 2. What is the in-feed length (distance from in-feed edge of the table to the start of blade) of this table saw? The GTS1031 table saw by Bosch has an in-feed length of five (5) inches. 3. What is the total size and weight of this table saw? From edge to edge the table width of this model is 30″ x 24″ and the total weight is approximately 52 pounds (23.5 kilograms). 4. 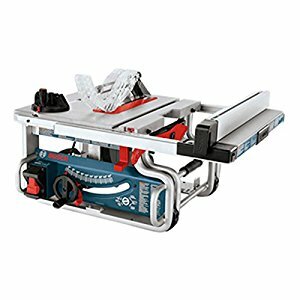 Can this table saw be mounted onto the Bosch TS2000 wheeled stand? Yes, but the beauty of it without the stand is how compact it is. All accessories mount within the saw frame. Comes with a mounted carrying handle as well. I have a lot of tools and shopped extensively for the right table saw, this one suits my needs, as a carpenter, perfectly. 5. Does the blade of this saw continue to spin when the saw is turned off, or is there some sort of braking system? One unique feature about this particular saw is that it has a on/off toggle switch with regards to the spinning blade. When switched to the “off” position the blade will come to an ALMOST complete stop when the saw is turned off. When in the “on” position the blade will continue to spin until it stops by itself. As a general rule, it is virtually impossible for a saw blade to come to a complete stop immediately after turning the saw off because the torque and speed of the blade would damage the motor. How does the Bosch GTS 1031 table saw compare to the Dewalt DW745 table saw? Quite favorably, to say the least. The DW745 is widely considered one of the best table saws, but it only runs at 3850 RPMs compared to 5000 for the Bosch saw. You can get an 18″ rip cut with the Bosch, compared to just 16″ with the Dewalt. The Dewalt can’t accommodate a 1/2 dado set, either. Both saws are equally easy to setup and use safely, and although the Dewalt is lighter the Bosch is much easier to store. Head to head, it’s no question: the Bosch GTS1031 is the clear winner. One attractive feature of this model is the Bosch GTS1031 dado compatibility. In fact, the TS1013 dado insert works exclusively with this saw. Another top selling point is the bevel angle range, which can adjust from -2 degrees to 47 degrees. The depth of cut you get with this saw is something else that a lot of carpenters like, as you get a maximum depth of 3 1/8″ at a 90 degree angle and a maximum depth of 2 1/4″ at a 45 degree angle. As you can see, the Bosch GTS1031 provides numerous advantages that other saws simply cannot match. If you are in the market for a table saw then we recommend giving this model serious consideration. It’s compact, durable, affordable and most importantly it has been repeatedly proven as a saw that will get the job done.